Buffet van Odette is an attractive eatery and popular for breakfast, lunch and dinner. Sit outside in summer and do some people watching or snug up inside when it gets cold. Indulge in a healthy breakfast; poached or scrambled eggs with salmon or try raisin bread with cheese, an acquired taste. Be sure to taste the famous truffle cheese omelets served with crusty artisanal bread. Artichoke with mustard vinaigrette sauce make you dream about France. Take your pick from the salad buffet or try squid and chickpeas. Be sure to try for dessert the lemon sorbet with vodka. 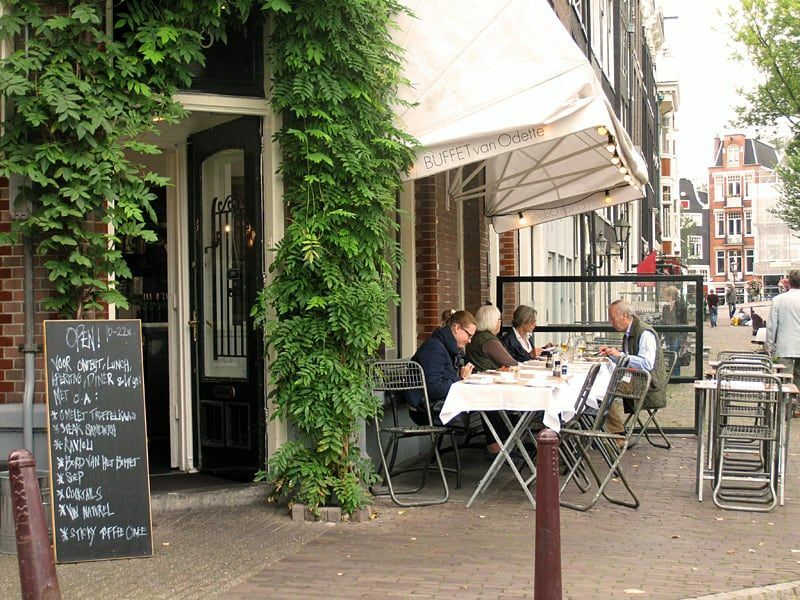 Buffet van Odette has a typical bistro atmosphere, classic and yet trendy. You’ll find here a nice mix of locals and tourists. Buffet van Odette is also ideal for a happy hour – a chardonnay goes very well with cheese appetizers or charcuterie and will delight everyone. Buffet van Odette is not a buffet but a sit-down cafe. Sit by the window foe one of Amsterdam’s prettiest canal views.